Orcs are a green-skinned, omnivorous species with a preference for meat. Orcs are a rather fecund race, able to replenish lost number given enough time. If it wasn't for their inability of cooperation beyond hordes, it is possible they could have overrun Aravorn. Orcs are capable of surviving in many different climates. The ones people are likely to encounter are on the plains, savannahs, and deserts. Orcs are a nomadic race, resembling the human Nomads in many regards. The one value they prize above all is strength. It is not uncommon for some strong leader to take control of a horde, whether through magic prowess or sheer force of arms. Orcs are also one of the most despised races in Aravorn. Their tendency to group into a massive horde, and lay waste to all in their path certainly doesn't endear them to neighbors. 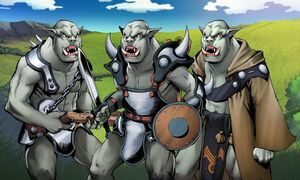 The variety of orcs one may encounter include warriors, and raiders. They are known to have magic-users, though they tend to be shamans or healers. This page was last modified on 3 May 2014, at 18:55.